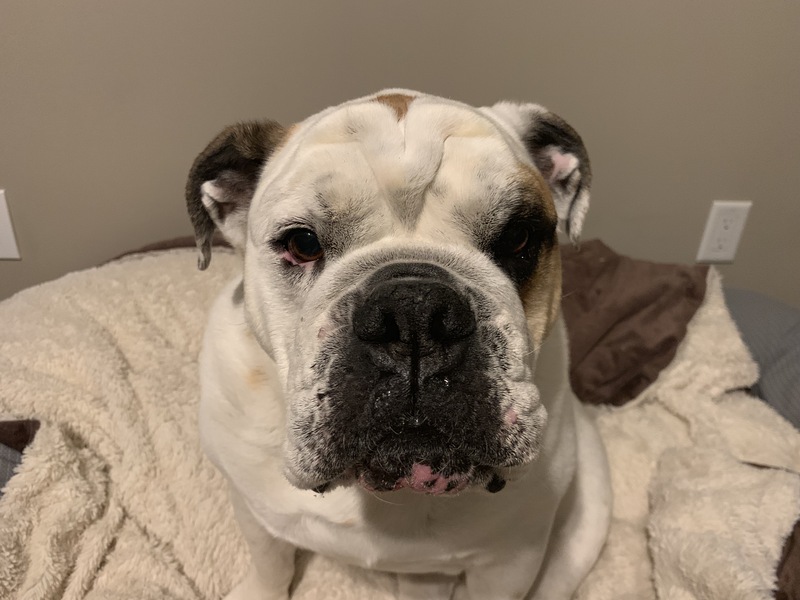 For this Waterloo dog training session we helped the guardians of 6 year-old English Bulldog Roscoe who has become increasingly aggressive to people he doesn’t know. “Snap praise” involves putting a prong collar on the dog and then jerking it up 15 times in a row and saying “good dog” each time. It is by far the worst thing I have ever heard a dog trainer ever advise to anyone, ever. There is absolutely no benefit to this action and if anyone ever suggests it to you, run away as fast as you can. I don’t like using pinch collars as studies show that long term use can result in a build up of Cortisol (the stress hormone) in a dog’s blood. Jerking a leash upward with a dog wearing a prong collar repetitively most certainly added massive amounts of Cortisol into the dog’s system and is absolutely a contributing factor to his stress. Since all aggression comes from stress, removing any stress causing factor is the first step in stopping aggression in dogs. Fortunately the guardians were already ahead of me in some regards, finding positive reward based training videos online. I started out with Roscoe in the room, but he was clearly stressed and infrequently reactive. Once a dog goes above threshold, you are not going to reach them. I suggested we put Roscoe in another room to discuss things and give everyone a reset. As I discussed things with the guardians, one of them commented on how she was anxious about his behavior while I was there and this can contribute to a dog’s stress and aggression. I was planning on bringing Roscoe out again for the last bit of the session, but decided against it as we really needed to go back to square one and having an anxious guardian can absolutely cause an aggressive reaction from the dog. This will allow the guardians and dog to reset, take a deep breath and start out on the path to positive dog training. That means understanding where the dog is coming from, what it’s trying to communicate and building up skills to add confidence and reduce stress. One of the best things the guardians can do is add a little structure to petting him and rewarding Roscoe when he offers desired behaviors on his own. I call this Petting with a Purpose and Passive Training. You can learn how to do both of these techniques by watching the free dog training video below. The more the guardians reward desired behaviors and redirect Roscoe into them to earn their attention, the more he will want to repeat this actions. My hope is that Roscoe will start pre paying for attention by sitting nicely and offering other positive behaviors. I told the guardians to focus on these positive dog training techniques for a month to allow the dog to forget about the snap praise, reduce the cortisol in his blood and build a solid foundation to build up from. I felt like the guardians were a little disappointed I didn’t work with Roscoe directly, but if the guardian is so anxious she would have to leave the room, that is not a good time to work. I want to give Roscoe every advantage possible as I have never worked with a dog who was exposed to “snap praise” for as long as he was. Its going to take some time. I hope to come back and work with Roscoe in a month once he is less stressed and practiced at offering positive behaviors and his guardian feels confident that he stop his aggressive behavior towards strangers. A few other exercises they can utilize are teaching him to focus, training him to move away from the door instead of charging it, wait for permission to go out an open door and to drop items on command. Id also like the guardians to teach him some new tricks and commands like the hurricane, how to stay for duration, stay for distance and others. Positive dog training is a wonderful way to build up positive training experiences, boost the dog’s confidence and strengthen the bond between humand and dog. I also suggested the guardians watch this video I shot with another dog who had shown aggressive behavior towards houseguests. By waiting for the dog to calm down before coming inside, Roscoe will be better equipped to listen and not be so aggressive or reactive. This exercise shouldn’t be attempted with strangers, just for people he knows and is excited to meet. To help the guardians remember all the dog behavior tips I shared in this in home dog training session, we shot a roadmap to success video that you can check out below.